First, know that Amaryllis bulbs do NOT naturally require a dormant period - i.e.. a forced rest over winter without light and water where the bulbs are stored at cool temperatures. These plants do grow year 'round in their native habitats. Some may require a resting period in the dryer cooler "winters" during which time growth slows down, but that is not the same as dormancy. Basically, continue to provide your Amaryllis with bright light over the winter months and continue to water it on a reduce watering schedule, allowing it to dry out just a bit in between waterings. Some plants may not produce any new leaves, while others may lose some of their lower leaves. You can also wait until the bulbs naturally emerge from dormancy, rather than forcing them. This may be useful strategy if you do not have enough windowsills to 'house' your amaryllis plants over winter. Let the plants die back in late November, or whenever temperatures dip to about 55 degrees at night. Then store the bulb as described above, and wait for it to natually break dormancy, usually in the spring. Follow Stage 1 Amaryllis care. 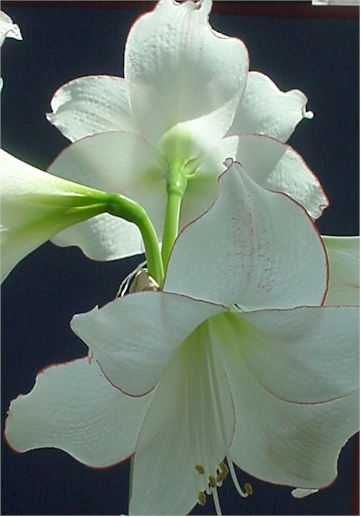 NOTE: There are some amaryllis species and hybrids that should NOT be allowed to go dormant, such as Amaryllis papilio and its hybrids.